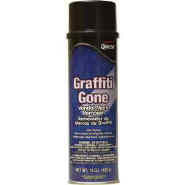 Graffiti Gone Vandalism Mark Remover makes graffiti easy to get rid of, and without damaging surfaces. The heavy-duty gel based cleaner works on wood, concrete, steel cement, tile and more. Also removes lipstick, ink, crayon and pencil marks.